Everyone knows the only respite from the hellish nightmare that is modern day air travel is an in-flight cocktail or two (but, ya know, not too many). It's especially nice when you build up a good rapport with the flight attendant and end up getting them for free. 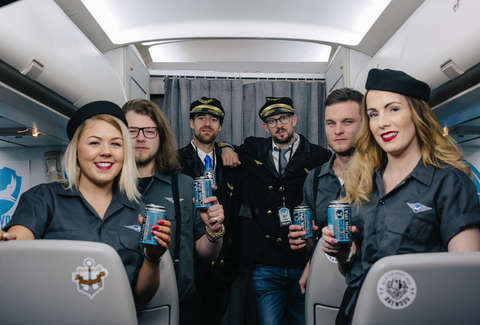 Now, you'll soon be able to cross the Atlantic on a carrier that's entirely dedicated to keeping your thirst quenched and your stomach full, thanks to BrewDog Brewery, which is launching "the world's first craft beer airline" complete with on-board beer experts, loads of food, and of course, lots and lots of craft beer. BrewDog, the Scotland-based brewery that also has a large American outpost with its own on-premises beer-themed hotel near Columbus, Ohio, just announced that it will be chartering a jet to take up to 240 passengers from London to Columbus on a special beer-fueled flight. The boozy flight will be followed by a four-night stay in Columbus filled with all sorts of beer-themed activities. 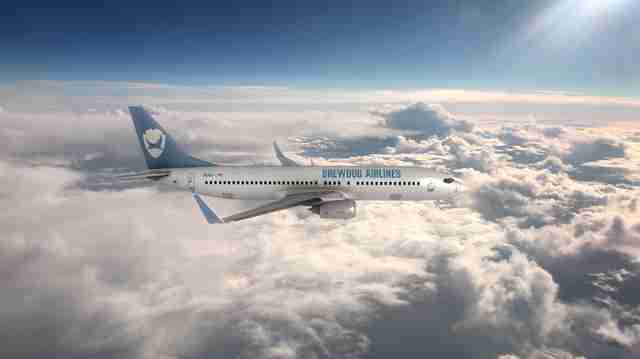 As for what to expect during the BrewDog Air flight, BrewDog says passengers will be able to sample a special limited-edition brew designed specifically for high-altitude consumption in addition to a number of other beers they make. There will also be special food and beer pairings, all presented by a cabin crew that's been trained by a certified Cicerone (beer expert). "BrewDog Airlines will be an experience like no other, we’ve redesigned the flight experience for optimum beer enjoyment -- from the food, to the entertainment, the cabin crew and most of all, the specially brewed high-altitude beer," said BrewDog co-Founder James Watt in a statement. In Ohio, passengers will stay at BrewDog's recently opened DogHouse Hotel, tour the brewery, and get to visit various other breweries, bars, and restaurants in the Columbus area. There will also be a day trip to Cincinnati. This inaugural BrewDog Airlines flight and trip will take place from February 21-25, 2019, and will be open exclusively to members of BrewDog's community of 90,000 crowd-funders (tickets are priced at $1,600 per person). However, they're also giving away trips to the general public and and will pick winners to come along (with a guest of their choice). If you want to throw your hat in the ring for, you'll need to stay tuned to BrewDog's Facebook, Instagram, and Twitter accounts. The February trip is the only one the brewery has on the books for now, but it's possible they'll offer trips from Columbus to Scotland at some point in the future, according to Cincinnati.com. Otherwise, you'll just have to wait until Oktoberfest next year and hitch a ride on Lufthansa for a chance to experience a free-flowing keg at 35,000 feet.